We flew in from airports across the globe and we all met in Yokohama, 150 Global YMCA Change Agents and leaders from World YMCA. In the port, just before embarking, Sofia from Sweden and Andrew from Sioux YMCA in the USA joined me and Shigeru Shimada san, the NGS from YMCA Japan for a press conference together with Tatsuya Yoshioka san and a board member from Peace Boat. This marked the official start of the partnership between World YMCA and Peace Boat, and we all expressed our satisfaction and hopes for the future. Some influential media from Japan and Korea were present and the press conference was also strongly focused on peace and critical remarks vis a vis the government’s attempt to introduce minor changes to Japan’s pasifist constitution. Japan YMCA had issued a strong statement in support of the constitution, and this was supported by the representatives of Peace Boat. Our good friends from Yokohama YMCA had turned out in big numbers with flags and posters, wishing all of us a happy voyage, and they followed the ship as we started our long journey. Thank you to all of you, good people of Yokohama YMCA, I shall come back and say thank you properly! A departure of a Global Voyage is something special for the Peace Boat, and this marked the start of the 88th Global voyage, basically going around the globe and returning to Yokohama December 8th. Fantastic! 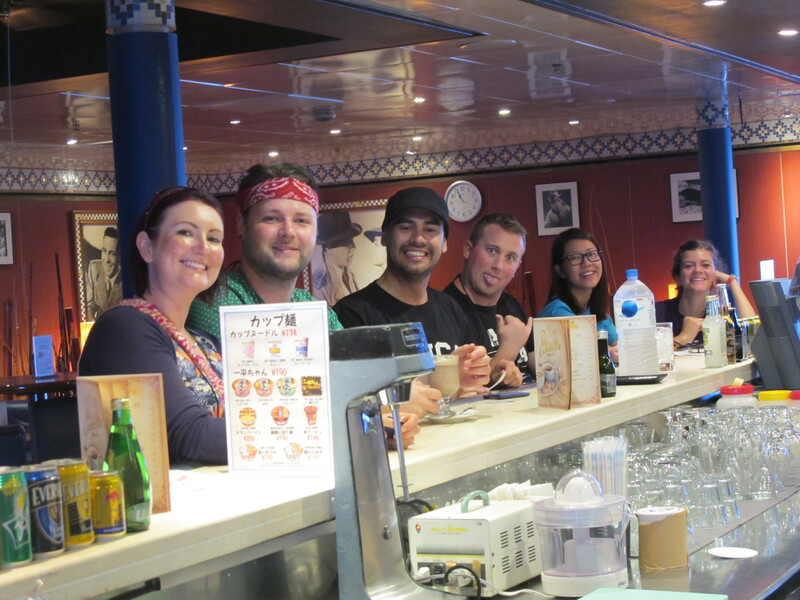 YMCA joined to sail from Yokohama to Cebu, the Philippines, and from there to Singapore. 11 days at sea, 11 days full of adventures and training, friendship and bonding, creating a unique global YMCA fellowship on board the beautiful Ocean Dream, our Peace Boat! A departure also includes a very strict security drill, I never stop being impressed with the crew and how seriously they deal with security and safety of the ship and all of us on board. We all follow the instructions, go to our cabins and take on the life waists and congregate where we are supposed to. From there we march in smaller groups, each of us to our dedicated life boat stations where we are ready to embark. At each stop of the ship the life boats are launched and tested by the crew, full of fuel, water and food, and functioning perfectly. On top of this very professional structure of well trained staff is the Captain, the Master of the ship. More about him later! At my side this young lady was sitting, and she turned out to be Aiko, one of the staff members from Peace Boat Organization, not crew of the ship, but of the organization. She is sports instructor, and we met early mornings the rest of the journey as I was participating with 6-7 other slaves, all of them elderly Japanese, in walking around the 8th deck from 06.00 to 07.00, basically walking from darkness and into brilliant sun-rises every day. Aiko was instructing Japanese passengers in Nordic Walking at the same time. Here departure from Japan, we wave goodbye to Japan and Yokohama, and the sea was quiet and easy as the music was playing and everybody felt uplifted and enthusiastic. A real adventure was taking hold of us, it felt almost surreal that we were all on board and ready to go, the first ever YMCA Global Change Agent training cruise in the history! Early morning meant healthy activities on all decks, and Japanese morning gymnastics is nothing to laugh at. People of all ages are stretching and bowing and moving to beautiful music as the darkness of the night gives in to the early sun rays creeping over the horizon far away. A great morning ritual that I watched walking from the the deck above. Capuchinos were found here, and early morning wakers were cuing up for the first cup in the morning. 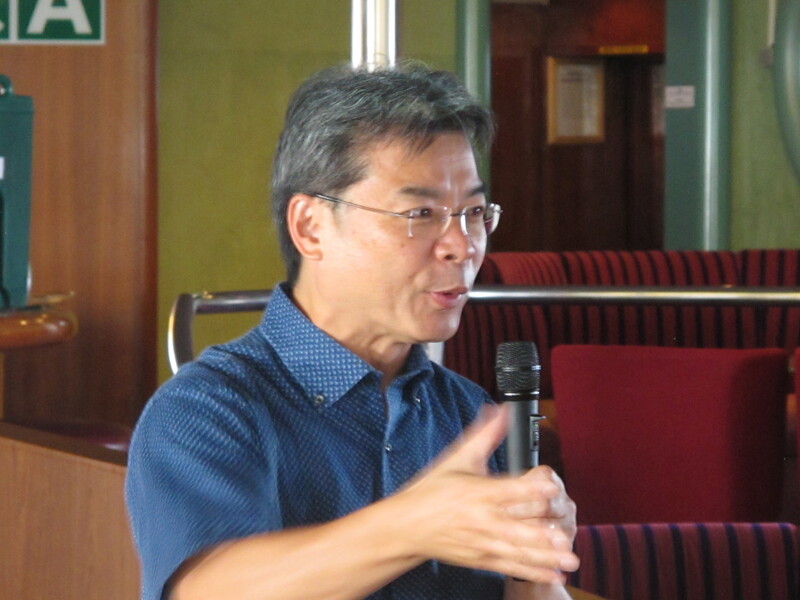 On the first day we invited the founder of Peace Boat and the Director of the company, the organizer of 88 world voyages since 1983, Tatsuya Yoshioka san, to give us a lecture about Peace Boat, his life and adventures, and also to give us the history and context of East Asia, where we are sailing. He impressed all the Change Agents and gave us an inspirational speech about starting from scratch and creating great things with impact around the world. In 2008 he was nominated to the Nobel Peace Prize. A great friend of the YMCA and also a great friend of mine. A visionary leader who sees opportunities when they come his way and who is able to turn around and make beautiful things happen.